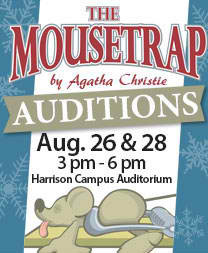 Auditions will be held this month for Mid Michigan Community College’s Community Theatre fall production of “The Mousetrap” by Agatha Christie. Five men and three women will be cast to perform in the play, which is celebrating its 60th year. Auditions will be held from 3-6 p.m. on Tuesday, Aug. 26, and Thursday, Aug. 28, at the Harrison Campus auditorium. Persons auditioning should come prepared for a cold read of script excerpts. The play tells the story of a group of strangers who are stranded in a boarding house during a snowstorm. The strangers, one of whom is a murderer, include the newly married couple who run the house, and the suspicions in their minds nearly wreck their perfect marriage. Others are a spinster with a curious background, an architect who seems better equipped to be a chef, a retired Army major, a strange little man who claims his car has overturned in a drift, and a jurist who makes life miserable for everyone. A policeman skis into their midst just in time for the jurist to be found murdered. And things keep getting more complex. To get to the rationale of the murderer’s pattern, the policeman probes the background of everyone present, and rattles a lot of skeletons. MMCC’s theatre is a community/educational environment to explore and create theatre art. Everyone is welcome to audition and participate in the productions. For more information, visit midmich.edu/theatre or email ykeast@midmich.edu. Following is a list of characters who will be cast in the fall production. Mollie Ralston: The wife of Giles Ralston, Mollie is the young owner of Monkswell Manor, a Victorian-era estate that has recently been converted into a guest house. Giles Ralston: Mollie’s husband of one year, Giles is the co-host of Monkswell Manor. Christopher Wren: A flighty, obviously neurotic young man, Wren is a guest at Monkswell Manor. Mrs. Boyle: Stern and generally unpleasant, Mrs. Boyle is a guest at Monkswell Manor. Major Metcalf: A typical retired British military officer, Metcalf is a guest at Monkswell Manor. Miss Casewell: A bit masculine in her demeanor, Miss Casewell, another guest at Monkswell Manor, remains mysteriously aloof from the other guests. Mr. Paravicini: An unexpected guest at Monkswell Manor, Paravicini is there only because his car became stuck in a snowbank during a terrible blizzard. Detective Sergeant Trotter: A late arriving guest at Monkswell Manor, the detective is trying to establish a relationship between any of the guests and a murder already committed at another location.